You can add shipping fees by using our Shipping options app and you can add as many shipping methods as you like. The app is designed to allow you to add shipping options for example your local post service, a courier service and other methods as well. Select what kind of shipping rate you offer. You can select from two options. Your first option is to offer a flat shipping rate, which will charge one standard price for all purchases made in your shop with this specific shipping option. Your second option is to offer weight based shipping rate. 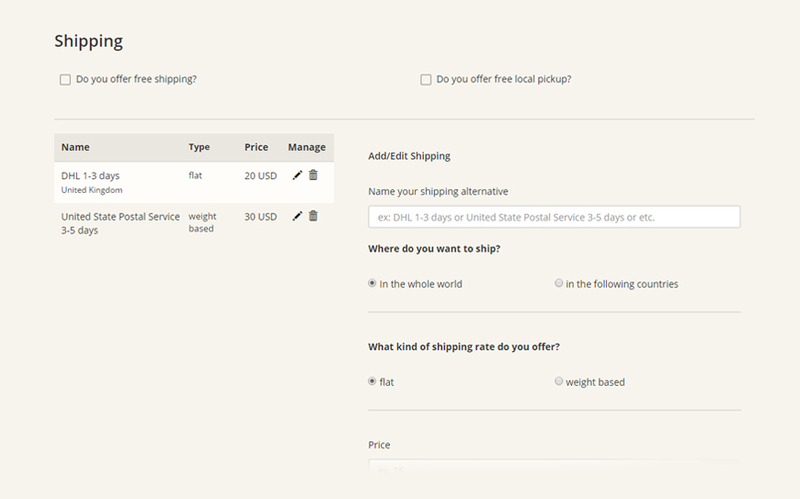 This option calculates the shipping fees based on the total weight of all products in the order. For this, you need to set up the weight ranges. The first interval will range from 0 and the amount that you set. To cap this range you will need to add a new range. To do this click the “Add weight range” button. You can freely decide which unit you wish to use, g, kg or lbs. Whichever unit you choose, make sure you use them consistently. Make sure that you add weight for every product in your store as well!! For example, the below weight range is up to 5g/kg/lbs and the shipping for orders in this interval cost $5. Orders between 5-10g/kg/lbs costs $15 and orders between 10-20g/kg/lbs cost $25. In our example we can set that orders weighing more than 20 g/kg/lbs will cost $30. If the total weight of the order is 23 g/kg/lb, the shipping fee will be $30. Make sure that you Save the shipping option. Now you are ready to ship. You can set free shipping for orders over a certain value. To do this check the Do you offer free shipping? option, enter the chosen value and save it. Free Local Pickup allows your buyers to pick up their orders themselves from a given address. To add the address, check the Do you offer free local pickup? option, enter the address and save it. The Shipping fees will be calculated on the checkout page of your Soldigo store.